Tasman Peninsula is a great place to travel. Tasman Peninsula is mostly known for the historical Port Arthur, so most people head right there and never get to see one of Australia’s best coastlines in Tasman National Park. The harsh climate and rough seas of southern Tasmania have created some amazing rock formations along this coast. Here is some information about the region, and in the end of the page is a map. The geology of Tasmania is different from this of the mainland Australia, because Tasmania's classic rock dolerite is found almost nowhere else in Australia. Dolerite is a very strong rock, and because other rocks have eroded around it, dolerite makes some most spectacular pillars in Australia. Here, on the coast of southern Tasmania, are some of the best examples rising out of the sea. 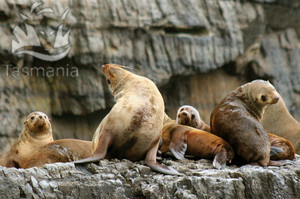 There is also a lot of wildlife to see on the Tasman Peninsula. From the high cliffs it’s easy to spot some marine animals like whales and dolphins swimming in the water, and seals and penguins resting on the coastal rocks. There are also many sea birds like terns and gannets, and some birds of prey like sea eagles and wedge tailed eagles. Land animals include possums, Bennet’s Wallabies, Tasmanian Devils and Tasmanian pademelons which are most active during dusk and dawn when it’s cooler. The park is also known for some rare plant species like euphrasias, oyster bay pines and some rare Eucalypts like Eucalyptus johnstonii. Tasman Coastal Trail is a great long bushwalk but if it’s too long you can choose to only make some parts of it. It starts south of Eaglehawk Neck and Pirates Bay, just south of Doo Town. It’s an easy walk in the start as it follows the coast to the beautiful Waterfall Bay. There is a climb to the Waterfall Bluff, where you have some great views and a camping ground. South from Waterfall Bluff the walk gets harder. There is a steep climb past Lichen Hill and Tatnells Hill, and then the walk descends again and follows the coast towards Dolomieu Point where there is a camping ground. 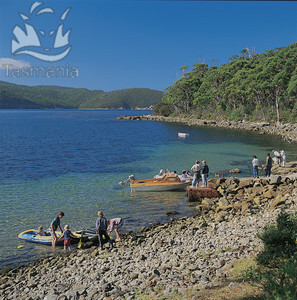 After the Dolomieu Point it follows the coastline of Fortescue Bay, in the end of which there is another camping ground. There is also a car road to the Fortescue Bay camping ground, which is consequently quite a big camping ground with over 40 sites that can also be used by caravans, and there are showers, toilets, rubbish collection, fire places and barbeques and even a boat launching ramp. After the Fortescue Bay campground you have two choices: either you can walk inland along the Cape Pillar Track, or you can walk the longer, but more beautiful coastal track, which also ends up going to the Cape Pillar (the two tracks are joined later, before the Cape Pillar). 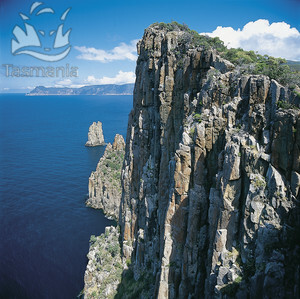 The coastal track goes first to Cape Hauy, one of the most spectacular dolerite cliff formations on the peninsula. From there it goes uphill towards Mount Fortescue, and after that it descends again towards Wughalee Falls where there is a camp ground. Shortly after that camp ground the coastal track joins the inland track towards Cape Pillar. Shortly after the tracks join, there is another camping ground at Bare Knoll, and then the track goes south along the peninsula past Munro Bright, Corruption Gully and Purgatory Hill to Hurricane Heath camping ground. From there, it goes further south past Perdition Ponds and Clytie Bight to the beautiful Cape Pillar – one of the most scenic places in Australia. 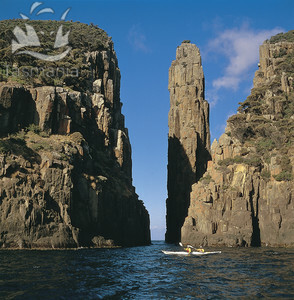 The dolerite cliff formations here are outstanding, and you have some great views of the Tasman Island. Apart from the long walk, you can do day trips to the Tasman National Park. Places you can access by a vehicle are Blowhole, Tasman Arch, Waterfall Bay and Remarkable Cave. Boating is popular in places like Pirates Bay and Fortescue Bay. Sea Kayaking is popular in Canoe Bay, hang gliding in Pirates Bay, and rock climbing on the Totem Pole and Candlestick – great dolerite rock walls at Cape Hauy. Totem Pole, by AllPosters, click on thumbnail to buy. Here's one of Tasman Peninsula Maps where I have tagged the places that I mentioned on this web page. You can click on the tags to see what places they are, and double-click anywhere on the map to zoom it in and see the places closer. Drag the map to move around, and if you want to see the satellite image with Google Earth, click on "Sat" in the top right hand corner.